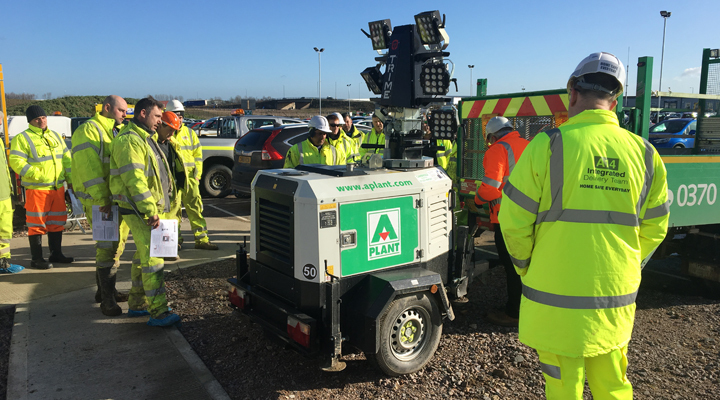 Trime UK has recently completed a series of on-site training and tool box talks for A-Plant, the UK’s leading equipment rental company. The programme was devised and implemented by Trime’s senior technician, Wayne Brennan, which included such topics as; secure operation, essential servicing, safety aspects and the environmental benefits of the Trime range of lighting. The X-ECO LED 6 brings together environmental, fleet management and operator benefits into one complete unit. It features 6 no. 150W, 48V multi-directionally adjustable LED lights floodlights, with safe 48V power between the generator and the lights. The vertical hydraulic mast has seven sections, rising to a maximum height of 8.5m with 340° rotation and wind stability up to 110 km/h. Easy lifting is via a central lifting eye with longitudinal and transversal forklift pockets for safe handling and transportation. A-Plant has invested in an initial 150 no. Trime X-ECO LED lights with the aim to provide crisp, clear light over a wide area with maximum fuel efficiency, low emissions, long running times. A-Plant forms part of FTSE 100 company Ashtead Group plc and is the UK’s largest equipment rental company with over 185 Service Centres nationwide, more than 3,600 employees and over 35,000 customers in the construction, industrial, infrastructure and events sectors. The Trime Group is a company that specialises in the design and production of lighting towers for the worldwide rental markets. The company manufacturing plant covers an area in excess of 15000 sq. Design, metalwork, powder coating, mechanical and electric assembly and final testing are all completed in-house. The company is considered to be the UK market leader in the supply of engine driven LED lighting towers. Trime UK Limited supplies their range of lighting towers to a wide range of UK and Irish rental organisations. Trime UK is headquartered in Huntingdon, Cambridgeshire; their manufacturing plant is based near Milan, Italy.